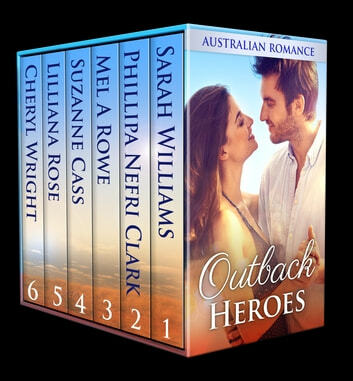 Bestselling Australian authors Sarah Williams, Phillipa Nefri Clark, Mel A Rowe, Suzanne Cass, Lilliana Rose and Cheryl Wright team up to bring you a collection of their most popular Outback love stories. When special-needs teacher Paige, takes up the position of Governess for three young children in the Queensland outback, she has no idea just how much and how quickly she would come to love the dusty, dry country, and the family who desperately need her. Logan was heartbroken when his wife died, leaving him to raise their three children with the help of his aging parents on their remote cattle station. Can Paige bring the family back together or have the wounds of the past cut too deep? Happy in her new life in River’s End, Christie loves the little cottage she’s renovating and the man she longs to marry. But storm clouds gather when a mysterious woman commissions a painting from Martin Blake, insisting on secrecy and creating undercurrents of suspicion. With only one chance to save those she loves, will her life be the price? After seven-years, Kat Jones returns to the outback town of Elsey Creek at the request of her dying Uncle. Kyle owns the only mechanical workshop in town, and he's about to propose to another woman when his ex rolls into his yard seeking help to restore her Uncle’s ute. Can they work together without re-igniting that spark shared those many summers ago? Or will it remind them of their promises of forever that ended in never. Witness to a brutal murder, Jenna is looking for a place to hide. The last thing Dan needs is trouble, after his time spent in jail. 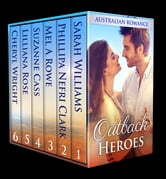 Can they let go of their pasts to defeat a killer in the harsh outback desert? Will she revert to her habit of running away when the murderer reappears? Or will she let him help her, and turn the hunter into the hunted? Maxwell is a farmer who once burned by love has decided never to open his heart again. When exhibiting his cattle at the Show he meets Zoe, a city girl. Can she get this tough farmer to open his heart without being hurt? When circumstances force Zoe and Max together, will their love help them find a future together? Devastated by the death of her fiancée, Marissa Temple needs time alone. House sitting for her friend in a quaint little town is the answer to her prayers for solitude. She vows never to fall in love again, but her persistent neighbour has other ideas. As the weeks pass, Marissa becomes torn between two loves; the one in the here and now, and the one in the hereafter. The first two books were good, especially the one by Phillipa Nefri Clark. However the others had a lot of fowl language which was offensive and so unnecessary. After starting, I didn't even continue reading the last couple of books.